European Central Bank President Mario Draghi pledged to keep interest rates low for a prolonged period of time in order to help the sluggish recovery in the Eurozone. That offered the euro the chance of a slight rebound versus the dollar, with the currency pair gaining 31 points to $1.3606. FX investors also remained on the sidelines as they waited for today's Non-Farm Payrolls report. The unemployment rate in the Eurozone remained at a record 12.1% during November as officials struggle to increase the pace of recovery. At the same time, Eurozone retail sales did rise by more than forecast but the pessimism surrounding the job sector, especially for the young, had the upper hand. As a result, the euro dropped by 43 points against the dollar, closing at $1.3573 ahead of today's ECB interest rate meeting. A fall in Eurozone CPI figures for December from 0.9% to 0.8% renewed concerns that the common area is facing deflation risks. 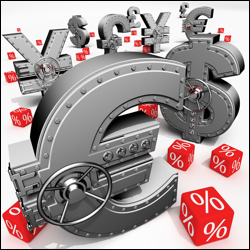 Consequently, the euro lost 15 points against the dollar, with the currency pair closing at $1.3614. The ECB remains under growing pressure to act should the situation deteriorate further, although it should be noted that last month's fall in inflation only reversed November's rise. Services in the Eurozone surprisingly expanded for a fifth consecutive month, sparking a slight rebound in the common currency and seeing the euro/dollar pair close 35 points higher at $1.3627. At the same time, fears of an imminent dip into deflation were eased by a small rise in Eurozone CPI numbers for November, albeit with expectations remaining below the ECB's ceiling of 2%. The euro continued its slump against the US dollar, losing 88 points to $1.3582 as investors expect tapering to carry on throughout this year. The Eurozone inflation report will be closely watched tomorrow as forex market reaction may offer a few hints on the ECB's next move. Towards the end of the week, the ECB interest rate meeting on Thursday will be followed by Friday's US Non-Farm Payrolls and these should offer some extra guidance for the currency market.